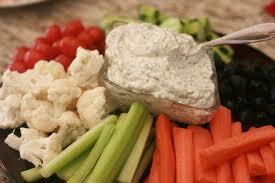 This is by far the best veggie dip I've ever had and my family loves it. It came to me from my long-time friend, Carla. It's been in her family for years and I've been making it for over 30 years. Mix together and let sit for several hours for the flavors to blend.